The all women's community chorus was founded in 1988 by director, Georgiana Smith and accompanist/vocalist Jeanne Kostelic during a time when Salida was struggling to recover from the loss of the mining and railroad industries. Other than church choirs there had been relatively few performing groups, so The Noteables were welcomed with open arms and rapidly became the group to contact for special occasions, benefit concerts and Christmas performances. Although the directors, membership and styles of music have fluctuated throughout the past 30 years, the group has flourished. The Noteables have been under the direction of Linda Taylor since 2008. 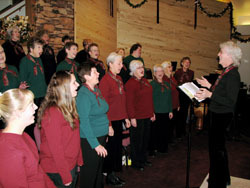 The chorus presents two concert series annually, each consisting of three concerts, one in December, the other in May. Membership fluctuates each season ranging from 30-45 singers. This is a non-audition group and new members are always welcome. Rehearsals for the Christmas season begin in September, for the Spring season in January. The Noteables rehearse on Thursday nights from 5:30-7:30pm. The Christmas programs include a wide variety of sacred and secular selections. Unusual arrangements of familiar carols, Celtic and multi cultural songs, whimsical novelty pieces, gospels, and songs about winter make for a very versatile concert series. Small ensembles add variety to the concert and give opportunity for more skilled singers. Most songs are accompanied by piano or CDs. Some songs are sung a cappella and many have additional instrumentation in the form of guitar, flute and percussion. There is something for everyone! The Spring programs also include a wide variety of sacred and secular selections. Easter, Celtic, Broadway and multicultural songs combine with pieces about spring and renewal, spirituals, and just about anything the director wants to try on for size! The director is animated and energetic and brings out the best in The Noteables with her creative teaching abilities. She makes having fun, while learning good vocal technique a priority. The group loves to move on stage and though the concerts are informal and often engage the audience, the singing still remains at a semi-professional level. Linda Taylor comes from a rich background of music. Pianist, singer, guitarist, director of music theatre and multiple community choruses. She has been giving voice lessons for over 30 years. Her energetic style of direction combines vocal technique, through the use of visualization and breathing exercises with a humorous and heart felt connection with the music. Singing with Linda produces instant results and is great fun. In 2012 she was voted as Salida's "best Mover and Shaker". Her motto is "When in doubt, sing!"